A man stands behind a lectern and near a microphone. An audience is in attendance. A sign behind the man reads: Employee Meeting. Man: All government employees are strictly prohibited from looking at the leaked NSA slides. The man is seen in a closer view in the second panel. Off-panel voice: But they're all over the Internet! 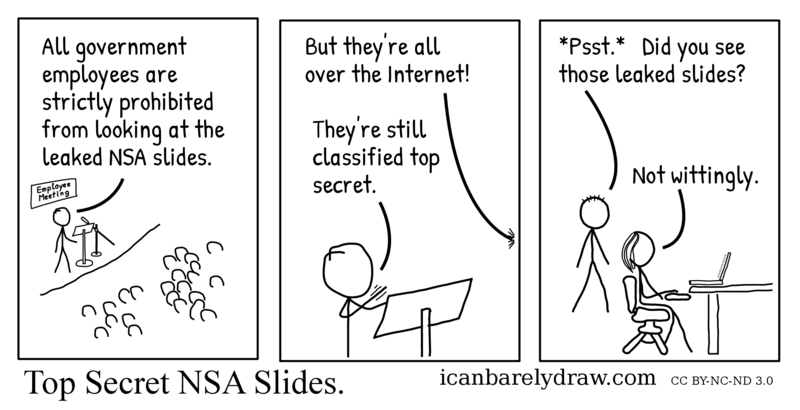 Man: They're still classified top secret. In the third and final panel, a woman is seen seated at a work table and a laptop computer. Behind her and nearby, a short-haired man stands. Short-haired man: Psst. Did you see those leaked slides? Title: Top Secret NSA Slides.